ISO 9001 certified for another year! 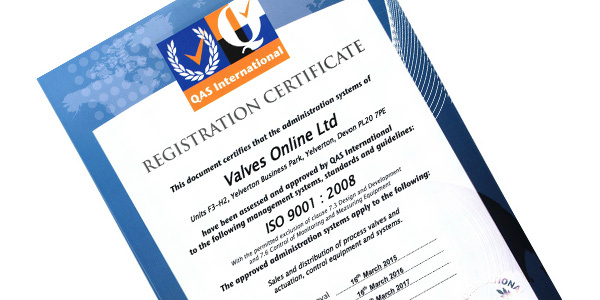 Simon Kelly, QA Manager at Valves Online is proud to announce that following a recent audit we have once again achieved certification to ISO 9001: 2008. Our administration systems have been assessed and approved by QAS International to the ISO 9001: 2008 management systems, standards and gudielines. Simon says "Many businesses and individuals fail to realise that an ISO 9001 certificate isn't issued once and that's it. It has to be periodically renewed and audited to ensure companies achieve continual improvement. Valves Online is doing just that." "Certification communicates to new and existing customers that we comply with this internationally recognised standard and demonstrating our commitment to quality." To achieve our objective meeting our customers’ expectations, Valves Online and its sister divisions (Select websites and Tecnica Europe) are totally committed to implementing and maintaining the Quality Management System based on ISO 9001:2008. Read more about our commitment to ISO 9001: 2008 or download a copy of our new ISO 9001:2008 certificate here.